It is the last day of January, and so it seems that my February blah's came a day early. Its the same drill every year at this time. The shortened days, grey skies, and feeling that winter will never end, begins to takes its toll. I crave a get-away. I'm not a sunny destination, beach-lolling kinda gal. In fact, I would happily deal with snow if I were to find myself whisked away to someplace that was far removed from ordinary life. Since the prospect of a holiday is nowhere in sight, I have to content myself with a little armchair travel, and a quick slip into an indulgent daydream. I find it handy to have some visual inspiration for this exercise. Care to join me as I dream myself away to my favorite place on earth? This photo by etsy seller Irene Suchocki is the perfect starting point. 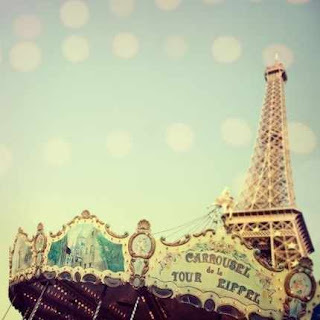 It captures my favorite bit of my favorite city: the graceful, towering spire that has become emblematic of Paris, and the whimsical allure of the French carousel. Irene's photos evoke a sense of softness and romance. Looking at one of her photos is exactly like falling into a dream. Fitting, no? I can't dream of Paris without visions of macarons dancing across my eyelids. 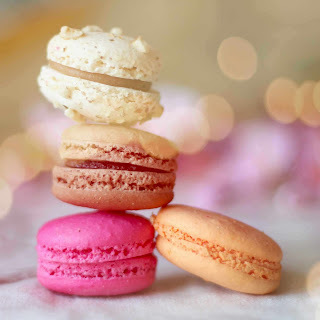 These little bites are the perfect Parisian treat, and their soft pastel colours are a cheery departure from the cold grey of Canadian winter. This beautifully delicious photo can be found in the shop of etsy seller Serpentine. Now,what would a trip to Paris be without an afternoon sitting quietly at a cafe, drinking a strong hot, cafe au lait, while the rest of the world rushes by? 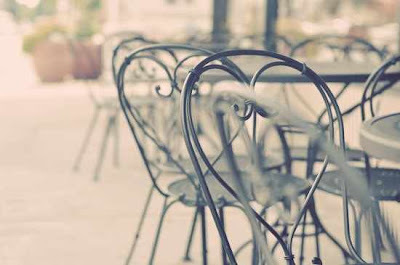 This beautiful photo of the cafe chairs where I would seat myself, was captured by etsy seller alicebgardens. I actually just came upon her shop, and I can tell you that I was instantly enamoured! And, since I am dreaming that I am in Paris, why not reach a little further and also imagine that it is springtime. 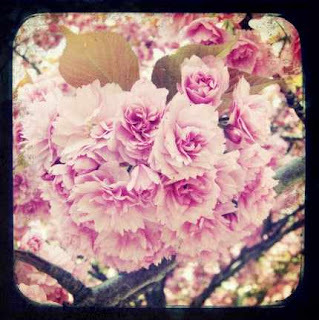 Spotted throughout the city are cherry trees laden with heavy, fragrant blossoms. This photographed was shot in front of Notre Dame Cathedral by honeytree. If I were to take this daydream to a truly far fetched, fantastical level, I would imagine that I had enough balls to drive those manic streets of Paris. Truth be told, I barely have the stomach to be a passenger! 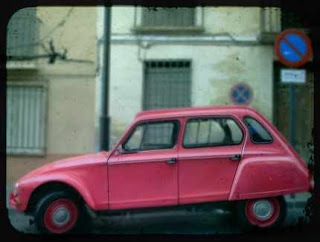 However, in this flight of fancy, not only am I behind the wheel heading out of the city to an idyllic country retreat - a Chateau stay, perhaps - but I am also behind the wheel of this classic Citroen in a charming shade of pink. This photo I found in the etsy shop of opart. You know, that actually was a very therapeutic little journey. I encourage you to rid yourself of the winter blah's and take yourself on your own little flight of fancy. Feel free to share your adventures here, and thanks for travelling along with me today. That's a very nice little journey. Thank you for including my Renault car. Oooo Paris. Sign me up please!! gorgeous, sweetie! i see you and i would love to take the same beautifully crafted trips!